One salmon supper a week is all it takes. But a healthy vegetarian diet is just as good for your heart. If you're seeking heart-healthy fare to put on your plate, fish is a first-rate choice. 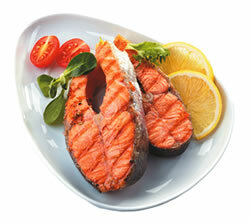 It's a good source of lean protein, and many popular types, including salmon and tuna, are rich in omega-3 fatty acids. These fats, docosahexaenoic acid (DHA) and eicosapentaenoic acid (EPA), may help prevent blood clots, stabilize dangerous heart rhythms, and improve blood pressure. These benefits may explain why people who eat fish a couple of times a week are less likely to have heart attacks or die from heart disease than those who avoid fish. But the findings on taking fish oil supplements haven't been as positive as those on eating fish. In a major study published in The New England Journal of Medicine, people who took fish oil capsules had just as many heart attacks and strokes as those taking a look-alike capsule. "People tend to equate the omega-3 supplement trials with the studies on eating fish, but they're not comparable," says Eric Rimm, a professor in the departments of epidemiology and nutrition at the Harvard School of Public Health. That's because the participants and the designs of the studies are completely different. People in the supplement trials faced a high risk of heart disease or already had it, so researchers gave them omega-3 fatty acids to see if the supplements could prevent the risky heart rhythms that can trigger sudden cardiac death. But many of the participants were already taking heart-protecting drugs like statins and blood pressure–lowering drugs. As a result, their risk of sudden cardiac death was relatively low. "It's tough to discern an added benefit from fish oil supplements in that situation," explains Rimm. In contrast, the research on eating fish has been done mainly among healthy adults without known heart disease. According to a report in the September 2014 American Journal of Medicine that pooled results from 19 different studies, fish eaters were less likely to have a heart attack or unstable angina (unexpected chest pain that usually happens at rest) than non–fish eaters. Most of the studies were prospective, which means the participants reported what they ate and were tracked over time—in this case, for an average of 11 years. Some of the benefit probably comes from the fact that when people eat fish they're not eating red meat or processed meat like sausage, bacon, or ham, which contain less-beneficial fats and a lot of salt. The Mediterranean diet, which has been shown to protect against heart disease, includes fish, Rimm notes. All the healthful components of this diet—which also includes plenty of vegetables, fruits, beans, olive oil, and nuts—probably have a synergistic effect. But fish might not be absolutely mandatory. "I think if you were to compare people who eat fish with people who eat a healthy vegetarian diet, the fish eaters probably wouldn't have a tremendous advantage," says Rimm. Many nutrition-conscious vegetarians probably get enough omega-3 fatty acids from plant sources such as flaxseeds, walnuts, pumpkin seeds, and soybean or canola oil. These foods are rich in a different omega-3 fatty acid, linolenic acid, which the body converts to EPA and DHA, albeit not very efficiently. But most people get about 10 times as much linolenic acid in their diets than DHA and EPA, which compensates for the low conversion rate, says Rimm. If you like fish, eating at least two servings a week may keep your heart in good shape. That amount delivers close to the DHA and EPA levels recommended by the dietary guidelines, which average out to about 250 mg a day. Worried about possible contaminants, such as mercury or other toxins? First, realize that meat and other animal products also contain trace amounts of unwanted contaminants. Second, the benefits of omega-3s probably overshadow any potential harm an adult would get from a tiny amount of mercury, which is mainly a concern for the developing brains of babies and children. To be on the safe side, if you are going to eat fish, eat a variety of different types, and focus on low-contaminant choices. with a single meal of fish high in omega-3 fatty acids, or multiple meals of species with lesser amounts. Source: Nutrition Journal, March 15, 2013, 12:33. Can a hospital stay make you anemic? Ask the doctors: Is a high potassium level bad?